Battlefield 4 Experiencing Multiplatform "Connectivity Issues"
DICE has posted a warning on its forums about ongoing "intermittent connectivity issues" affecting Battlefield 4. 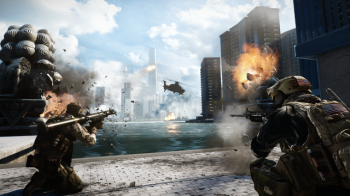 Online multiplayer is kind of a big deal for games like Battlefield 4. In fact, while the game does have a single player campaign, you would probably be safe in saying that the vast majority of its fans buy and play the game for its online experience. That said, when the game can't connect to the internet, it's kind of a big deal. That in mind, DICE has unhappily had to inform fans that Battlefield 4 is currently experiencing a connectivity issues across multiple platforms. These issues were confirmed via an announcement at the top of the Battlefield 4 forum page. This bad news comes only a short time after fans recently endured a week of service brownouts and blackouts. DICE and EA have also been working to fix a bevy of other persistent problems including lost game progress, crashes and DLC issues. The game has had enough problems since its launch that DICE actually started up an "issue tracker" earlier this month to help keep players up to date on the game's biggest problems, as well as the developer's progress in resolving them. All of this said, we suspect that there may be some unhappy Battlefield fans at the moment.